Two years ago, I spoke and wrote about 'Surviving Law School' to wide-eyed first-year students coming into the Law Faculty of University of Malaya (UM). A new batch of freshies arrived just last week. On hindsight, I think that the title of the talk needs changing. Surviving law school? Now, that's easy. Heck, anyone who made it to law school can do that. Rarely do students drop out, or fail so badly that they have to extend their course beyond 4 years. Despite what your parents and peers think, graduating from law school isn't really such a great feat. Succeeding law school? Now, that's much harder to attain, and what you should really be concerned about and focusing on. Your goal shouldn't be graduating from law school, but graduating from law school with an impressive resume and reputation that employers are queuing up to hire you. So here's an updated piece of advice to the barely surviving freshies, and also the older survivors in law school who haven't succeeded just yet (which, going by the definition below, includes all of you). You beat thousands of other hopeful students to get into UM. Now you're in a pool of 100+ undergraduates. Safe to say, you can consider yourself as the Top 10% law students in Malaysia. Good enough, right? No. 'Good' is never 'good enough' in UM. You should aim to be better. To go from good to great. Aim to be the Top 10 of your batch, Top 1% in the country. Even better, win an international moot competition, and be top of the world. So you've done well in your first year. Got into the Dean's List (3.7 GPA), very active in projects, and won a local novice moot competition. Congratulations! But you've only just begun. Success is not measured by the number of certificates in your file, or trophies on your cabinet. Success is a journey, not a destination. As the saying goes: "form is temporary, class is permanent". Success in a single semester, a single project, a single competition - that could be due to a stroke of luck, or the efforts of other people. To have a streak of successes over the course of your four years of law school - now, that's solid proof that you're the real deal. It's tempting to rest on your laurels, to shirk away from new challenges. You're afraid you won't repeat your previous success, that you'll taint your legacy. Well, better get over such insecurities right now. The real world you'll be facing post-graduation measures success as a marathon, not a sprint. You think 4 years of law school is tough? Wait till you face 40 years at work. Four years of law school almost done. Your resume looks sparkly. You're the top 10 of your batch. Congratulations! But what do your lecturers and friends really think of you, deep down in their hearts? Are you the object of hate or envy? Or the object of admiration and inspiration? How many toes have you stepped and hearts have you broken on your way to 'success'? Your resume is just a piece of paper. Your reputation is what sticks in people's heads. Word gets around very fast in today's world. Positive recommendations can get you through doors even if your resume isn't too sparkly. A single negative warning can stick a giant red flag on the sparkiest of resumes. Treat people with respect. Be kind and generous. Help your struggling classmates. Train your juniors. Engage in deep conversations with your lecturers on the complexities of law, love and life. What's the secret of success? 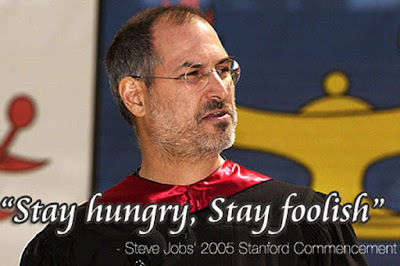 In his legendary 2005 Stamford commencement speech, Steve Jobs says this right at the end: "Stay Hungry. Stay Foolish." Don't be blinded by your small sparkly successes. Don't think you're ever good enough.